If you have kids, their browsing habits (running scripts and so on) might lead to spyware being installed and executed automatically on your computer. If you have a local network, it might be that for someone in your house (or office) the same situation could exist. Some spyware can be configured to activate your webcam and either take images at regular intervals or continuously. To combat this, you can either unplug your webcam every time your teenage daughter leaves it to go and do a few more pages (or lines) of homework (and get moaned at both by her when she comes back and the system which has to detect it again and set up all of the drivers and so on each time it is plugged in) or you can cover up the camera. If you just put a piece of paper in front of it, this can get knocked off and so on. The origami webcam cover therefore is your ideal solution and here is how to make it. 1 First of all, you need to have a square sheet of paper. In origami, this is usually coloured on one side and white on the other. The size is important because the box that we are going to end up making will be one quarter of the size of the side length so, for the commonly available 6" square origami paper, we will end up with a box with an edge of 1.5". The hole we will end up with in the bottom - the hole through which we will put the end of the webcam - has to be smaller than this but not too small. Once you have made one, you can cut down a piece of paper to make the box the size you want it. If you want to make it to cover one of those sphere-type 'eyes' that sit on top of your monitor, you might want to choose a larger piece of paper. 2 With the white side facing upwards, make a fold so that one corner goes over to its opposite corner. Take care to make sure that folds are accurate and sharp - run your finger nail along the fold. Also, it is a good idea to do this on a flat surface, at least to start with as curved or uneven surfaces can make your folds go wrong. 3 Now open it out again and create a fold at right angles to that by folding the other pair of corners over to meet each other. Open it out again and you should have a square of paper with two diagonal folds that face the same way, concave side to the white side. 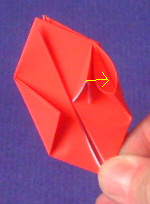 4 With the coloured face on the inside, fold the paper so that two opposite edges meet. Then, open it out again. 5 Repeat with the other two edges, opening out again after you have made the fold. You now have a piece of paper with four folds in it, two facing one way and two facing the other. 6 If you push the white centre-face in so that it becomes concave, the diagonals will fold down and the other folds will fold up, producing a triangular shape. If you have produced a diamond shape, you have done something wrong and you can either force the folds the other way or make a frog out of it. Next, fold one of the corners up so that its point touches the apex of the triangle. Here, we are folding one on the right, forwards, along the yellow line so that its tip touches the apex. 7 Now repeat with the corner on the left, folding towards you so that you end up with a mirror image of the one on the right that we have just done. 8 It should now look like this. Turn it over and do the same on the other side. 9 Now, fold in the corners to the medial line that we have been forming. Make sure that the tip of the corner falls on an imaginary line that runs between the two opposite corners - this should make the fold run parallel with the medial line. 10 Repeat this with the opposite corner. 11 It should now look like this. 12 Turn it over and do the same to the opposite side. 13 Take one of the loose tips and fold it down so that the tip's medial edge lies along the medial edge of the rest of the tip that it is being folded down onto. The yellow, fold-line is at 90 degrees to that medial edge. Take care to leave a small gap of between 0.5mm and 1mm between the already folded edge of the tip and the piece that sticks out that we folded in on stage 9. You will see why in a minute. 14 Now, fold the folded tip over again, but so that it's fold goes from the centre, to the corner - following the yellow line. 16 Now, we need to stuff the flap we have created in steps 13 and 14, into the fold that we made in step 9. This should fold in flat which is why we left the small gap in step 13. 17 Now repeat steps 13 to 16 for the other three tips. 18 Next, we need to create the creases that will allow the gussets we have made to open up when we turn it into a cube. These will be made along the yellow lines. 19 Fold the end over, along the yellow line in step 18. Then, fold the other end over. Next fold them the other way. If you take care to do this neatly, you can make quite a good job of it. Finally, fold the origami piece flat again. 20 It is now time to violate the laws of origami and get out the scissors. We are going to cut a line at the open end. If you were making a water bomb, you would put this opening up to your mouth and blow in it, inflating the bomb. Then, you would fill it with water and throw it at somebody but we are not going to do that. Are we? The hole we are going to make has to be large enough to allow us to put the cover over the web cam. So, having made your measurements, make your cut half of the aperture size from the apex of the origami piece. 21 Next, put your finger inside and pull out the shape, working your way around, making the creases sharp and straight. 22 Finally, we have our box, ready to put over the webcam. 23 And, here it is, in action. Windows uses a system for file and printer resource sharing called SMB. In GNU/Linux, the process is called Samba. Each machine needs to have an SMB server for other machines to see its resources and an SMB client for it to see the resources on other machines. In Windows, you just need to set up file and print sharing and all is done. In Linux, you need to configure and start the services. Although this sounds like it is a bit more of a hassle in Linux, you only need to make sure the configuration files have the correct information and you have the right services running. This is done using a text editor such as KWrite instead of working yourself through a maze of silly wizards. First of all, you need to get Linux to recognise the SMB shares. To do this, you need to run smbfs which can be done in the list in the Runlevel Editor in the Control Centre in YaST2. 1 Mount the file shares in your file system somewhere using /etc/fstab. Note that, as in the case of the second line, the mount point does not need to have the same name as the file share - here, 'workpics' being mounted as 'wpics' and so on. If you go into InfoCentre, and select 'Storage Devices', you can see the file shares and you can mount them by clicking on the relevant line in the right pane and selecting 'Mount Device'. With the share mounted in your file system, you can access the files as though they were on the same machine. You can make them mount at boot time by editing the information at the end of the line but if you have a machine that is not online, this can slow down the boot process as the system waits for the connections to the other machines to time-out. 2 Use the smb:// KIOSlave (this was discussed in PC Plus HelpDesk issue 214). Instead of typing smb:/gem/[share]/, you can type smb://[share]/ if you are on the same workgroup. This allows you to see directories and files (and printers if you want) on Windows machines on the LAN. To get this working, you need to have the smb daemon and the nmb daemon running (you can check this in the runlevel editor in YaST2). Open up the file /etc/samba/smb.conf in KWrite and at the bottom of the file, include the shares you want. This creates a share from the Linux machine (from a directory called '/nas/cache') that in a Windows machine appears in the network file structure as opal\NetStore\ that the user can read from and write to. Use the mask numbers to limit access - this was discussed in HelpDesk PC Plus issue 213. Many websites claim to be able to tell you your IP address but unfortunately, all they can tell you is the IP address of the proxy server that your ISP routes all of your Internet traffic through. This is simply because that is all that the website's webserver has been told to look for. If you search Google using ip address (http://www.google.com/) then look at the sites with 'my IP address' or 'what's your IP address' or similar, you will get a variety of IP addresses (look at just the last number in the address as it is likely that the first three will be the same in each case. This should happen unless you happen not to go through a proxy (or your ISP only uses one proxy server). To find your IP address, so that your friends can look at your web server or whatever service you wish to provide, you can go to http://checkip.dyndns.org/ where they have sorted out the problem.